In Japan when walking in a residential area in summer, we often hear the timbre of “Furin.” The cool sound of ”tinkle-tinkle” makes us feel like the heat lessens a bit only by listening to it. “Furin” is a small bell made of metal or glass and usually hung on the eaves of a house during summer. Under the bell, a piece of rectangular paper is attached and some old Japanese poems or songs are written on it. The bell rings as the paper waved by the wind. The gentle and cool sound from metal or glass is a typical thing in the hot and humid Japanese summer. 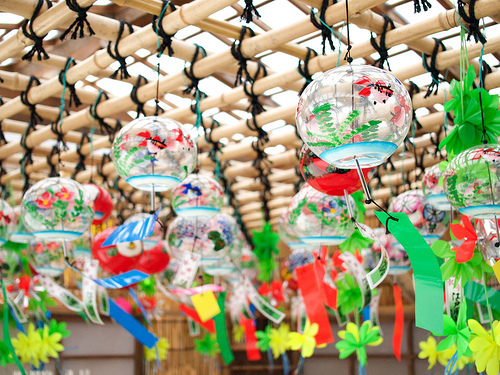 “Furin” originates from the Chinese tool called “Senfutaku”. “Senfutaku” is a tool hung in the bamboo forest and told good luck or bad luck by the direction of the wind or the way of ringing. It was introduced into Japan as Buddhism spread. It is also said to be an amulet and it is believed that when an amulet hung on each of four corners in a temple, misfortune will not happen to the residents who can hear the sound. Thus they were hung to prevent the plague coming in the house in the Heian period and the Kamakura period in Japan, too. 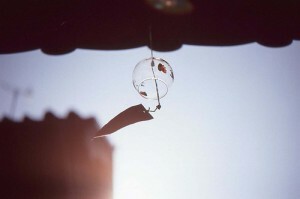 The “Furin” made of glass like today started to appear about 300 years ago from now. It is said glass craftsman started to make them as an exhibit. As there were not so many ways to craft glass at that time, it is said that they were sold as much as two to three million yen! It is a thousand times as that of today! Though they had been so expensive once, now they have become easy to enjoy even for the people since the glass crafting skills have spread and the price of glass lowered. 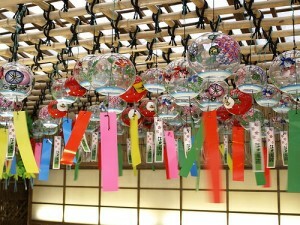 There are various kinds of “Furin”, and among them, the most famous one is “Edo Furin”. As its name suggests, it’s been made since the Edo period. Before being named Edo Furin, it was called Glass Furin or Bidoro Furin. Since Edo Furin is handmade one by one, each one rings differently even if they were the same shape and the same design. The feature of Edo Furin is to leave the notches on the opening of the bell deliberately. If it was made smooth like an opening of a cup, it will not ring very well because the clapper will slide. The Edo Furin which craftsman make carefully one by one mekes us feel cool by both its sound and looks.